They are all awesome!You lucky one,so rare pieces and so detailed.I like the monkey most! "keep cool - has a chocolate Heart"
Great additions, those are some of the best. Thanks folks. Yes, I was quite lucky to acquire these. I missed out on the WWF running oryx and a few others. The seller actually had two bongos; one of them, not mine, went for over $4,000! As I said, the bidding was VERY heated during the last few moments. The Bongo and the Colobus are great looking. They will really add to your zoological garden. 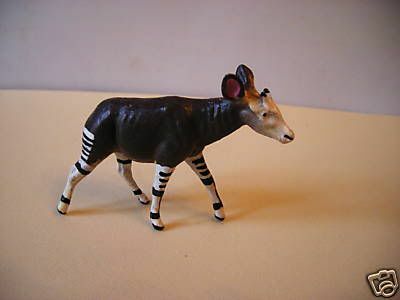 The one you buy is the 1728 Okapis from the early 1970's. As of today's bidding I now own both.